The first We Day Connect took place May 4, 2018, from Seattle. Microsoft vice-president Anthony Salcito, second from left, and We co-founder Craig Kielburger, right. They joined with students, including Asha, left, and Imani, from West Creek High School in Washington state for the webcast. Students have been flocking to WE Day stadium events for more than a decade, but now the show is coming to them. This year, WE Charity launched WE Day Connect, a digital webcast that takes the stadium experience into classrooms around the world and links students globally. The initiative has already reached hundreds of thousands of students, and organizers hope to push that number into the millions within a few years. “It’s like the Super Bowl for youth changing the world,” says Carrie Patterson, the chief operations director for WE Charity. In partnership with Microsoft, the inaugural WE Day Connect was streamed live last May from the tech giant’s hometown of Seattle. Via Microsoft-owned Skype, students viewed a 90-minute interactive show similar to what they’d see if they attended any one of the stadium events in cities such as Toronto, Vancouver and New York. They saw WE Charity co-founder Craig Kielburger and four other high-profile speakers, along with five groups of U.S. students who presented their accomplishments from the past year. Students at Interlake High School in Washington, for example, shared details of their project to provide reliable electricity to 30 homes in Mexico. 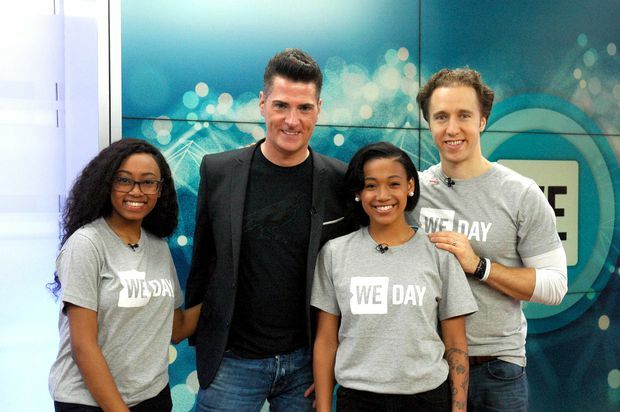 The next WE Day Connect will take place from Toronto on Nov. 29, with classrooms Skyping in from across Canada. The 2019 edition of WE Day Connect will take place in a U.S. city that is still to be determined. WE Day Connect fits into a growing trend of connecting students around the world. Jennifer Casa-Todd, a teacher and librarian with the York Catholic District School Board near Toronto and author of the book Social LEADia, says students and teachers from around the world have been engaging since at least 2011. Ontario is just now starting to redefine the “learning” skills on a report card to talk about global competencies, one of which is citizenship. “The definition when they talk about [citizenship], it’s to understand diverse world views in order to address social, political and economic issues and have an appreciation of the diversity of perspectives,” says Ms. Casa-Todd, whose class has connected with students in Norway and Uganda in the past via Skype. With her students, she says, technology isn’t about just having a digital system in place that helps to save paper on handouts. “The most exciting thing is the ability to connect globally,” she explains. She says the opportunity to digitally connect students with fellow learners from around the world is more important than ever, as social media specifically has become a one-dimensional tool. Every school that signs up for WE Schools gets an invitation to WE Day Connect, along with access to other virtual events, a digital program manager, and a kit with access to one of Microsoft’s digital note-taking applications. The partnership with Microsoft began in 2013 and Ms. Patterson at WE Charity says it’s been a perfect marriage between technology and education. WE Schools is part of a grander trend of digital learning that has allowed students to broaden their educational horizons. Mr. Salcito at Microsoft says the company wanted to help take the WE Day energy and make it available to other parts of the world. Editor’s note: Jennifer Casa-Todd works for the York Catholic District School Board. An earlier version of this story incorrectly said she's with the York Region District School Board.